We'd all really like to get to know the deep hidden secrets. The laws of attraction. How is it that we sometimes walk into a room full of people and our entire focus is aimed at that one person? What is it that causes us to forget the whole environment around us and we jitters feel? Our heart is in full swing and we are very nervous. How can this happen? And we can from these feelings predict any future relationship? An even more interesting question is whether it is possible others a sense of glamour to deliver. For example, besides appearance, common features and like the reciprocal is another important factor, frequently examined by social psychologists, who feel attraction can influence. This is our mood. Emotions and our moods affect how we feel and how we attribute these feelings to environment, people and situations. Emotions are difficult to define. The Most psychologists agree, however, that there are at least four basic components exist that determine when emotions. These are the experience, the feeling of physiological arousal , expressive reactions and related behaviors (Reisenzein, 1983). Our psychological system of appeal is also rooted in evolution. Attraction is one of the three primary emotional psychological systems of mating behavior. This is characterized by an increased energy and focus of attention to one or more of potential partners (Fisher, 1998). Emotions and attraction can never be seen in isolation. There is an overlap, and both phenomena influence each other. A psychological experiment about how our mood our sense of attractiveness influences to affect others, has found that people who feel good, facilitate a sense of (sexual) attraction to others will call. The male participants were in a positive or negative state of mind brought by listening to music. The participants in a positive mood were brought felt more excitement and sexual attraction as they viewed a sexually explicit video, compared to those who were not manipulated or negative. This means that people who feel better or happier, quicker arousal and attraction feel and therefore easier to find someone (sexually) attractive (Mitchell, DiBartolo, Brown & Barlow, 1998). The influence of attraction through our mood is also found by another very interesting psychological experiment. Here, male participants were in a romantic mood by means of hypnotic methods. These participants felt faster arousal and thus more attractive to others than the participants who were not charged. in this state of mind This was the case even if there were little to no common properties, while this is an important factor in the sense of appeal. Some participants knew about the manipulation, but the participants who had not even scored higher on the feeling of attraction. This means that if you cannot explain where your good mood comes from, is easier to ascribe this to people and the situation around you exactly (Gold, Ryckman & Mosley, 1994). 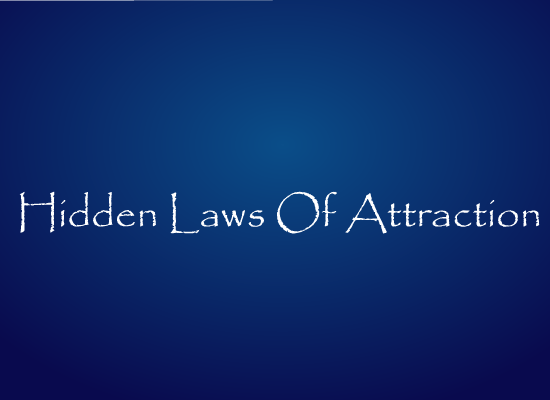 The "laws" of Attraction? Create it yourself! These findings tell us much about the power of attraction. But what will happen when our mood changes or disappears? We do not always feel the same and all of these changes make it even more difficult to determine whether we really like someone or that we make mistakes in explaining us good or positive feelings. This is where the uncertainty lies with social interaction and attraction. No one will be the "laws" can figure out. So let's just create our own laws and decide to whom we give our precious attention! Makes life a lot more exciting and secretly perhaps much more fun! Fisher, HE (1998). Lust and Attraction and Attachment in Mammalian Reproduction. Human Nature, 9, 23-52. Gold, JA, Ryckman, RM, & Mosley NR (1984). Romantic Mood Induction and Attraction to a Dissimilar Other: Is Love Blind? Personality and Social Psychology Bulletin, 10, 358-368. Mitchell, WB, DiBartolo, PM, Brown, TA & Barlow, DH (1998). Effects of Positive and Negative Mood on Sexual Arousal in Sexually Functional Males. Archives of Sexual Behavior, 27 (2), 197-207. Reisenzein, R. (1983). The Schachter Theory of Emotion: Two Decades Later. Psychological Bulletin, 94, 239-264.